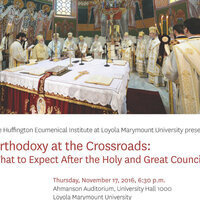 "Orthodoxy at the Crossroads: What to Expect After the Holy and Great Council"
2016 witnessed to an epic event in the Orthodox Church. In June, ten of the world’s fourteen autocephalous Orthodox Churches gathered for the Holy and Great Council in Crete and issued documents on marriage, fasting, and relations with the world and non-Orthodox Churches, among other teachings. Controversy and intrigue surrounded the Council, especially its final statement on the status of non-Orthodox Churches: areCatholics, Episcopalians, and Lutherans Christians or heretics? Are they Churches, or schismatic communities? How should Orthodox people relate to other Christians, and what is their responsibility in the world? Bishop Maxim (Vasilijevic) of the Western American Diocese of the Serbian OrthodoxChurch in North and South America, V. Rev. John Behr, Dean of St. Vladimir’s Ortho-dox Theological Seminary in New York, and V. Rev. Archimandrite Cyril Hovorun, Post-doctoral Teaching Fellow of the Huffington Ecumenical Institute, will talk about theChurch’s responsibility in interpreting and receiving the teachings of the Council in Crete.